Letter recognition the fun way! I found lots of lovely letter resources and threw them together to make an enticing game. The squishy letters with the gel inside are everyone’s favourite. The idea is that the children put the letter in the box while they say the sound. 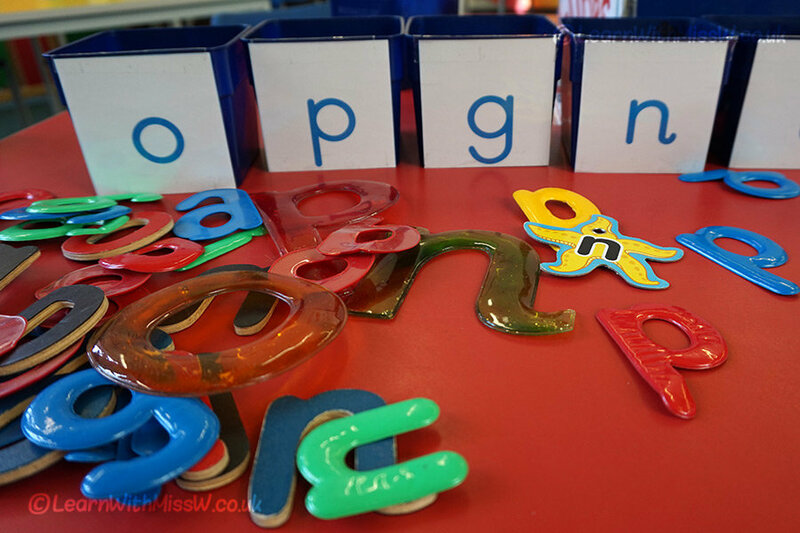 The 3D letters give them the opportunity to feel as well as see the shape of each letter, and they pay particular attention to the letters with holes in them! I have been playing this game with some of the children who need a bit of consolidation and who would benefit from feeling the shape of the letter in order to remember it and make connections to the sound. Realistically, not all the children are saying the sounds as they sort the letters, but as they are matching the shape to the visual on the box they are reinforcing their recognition of the shape. As you can see, there is a bit of an issue with the fonts not being quite the same. Lots of commercial resources don’t have the flicks, but this is something that the learners will have to get used to as they see print in different places. I avoid putting common muddly letters together to prevent reinforcing the confusion, e.g. ‘b’ and ‘d’. Because the letters can be turned around and over, a ‘u’ can become an ‘n’ etc. as well. I have again limited the game to 5 letters at a time and I am not changing it too often as I want all the children to be secure before the letters move on. I have put in no distractor letters that don’t match the boxes. You could also try this game with some starting letter pictures or objects, although I sometimes find this gets more complicated as the children don’t know whether to put the toy in ‘p’ for puppy or ‘d’ for dog!